"Securities and Exchange Commission" redirects here. For other uses, see Securities and Exchange Commission (disambiguation). 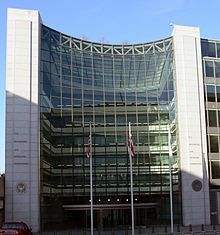 U.S. Securities and Exchange Commission headquarters in Washington, D.C. The U.S. Securities and Exchange Commission (SEC) is an independent agency of the United States federal government. The SEC holds primary responsibility for enforcing the federal securities laws, proposing securities rules, and regulating the securities industry, the nation's stock and options exchanges, and other activities and organizations, including the electronic securities markets in the United States. In addition to the Securities Exchange Act of 1934, which created it, the SEC enforces the Securities Act of 1933, the Trust Indenture Act of 1939, the Investment Company Act of 1940, the Investment Advisers Act of 1940, the Sarbanes–Oxley Act of 2002, and other statutes. The SEC was created by Section 4 of the Securities Exchange Act of 1933 (now codified as 15 U.S.C. § 78d and commonly referred to as the Exchange Act or the 1934 Act). The SEC has a three-part mission: to protect investors; maintain fair, orderly, and efficient markets; and facilitate capital formation. To achieve its mandate, the SEC enforces the statutory requirement that public companies and other regulated companies submit quarterly and annual reports, as well as other periodic reports. In addition to annual financial reports, company executives must provide a narrative account, called the "management discussion and analysis" (MD&A), that outlines the previous year of operations and explains how the company fared in that time period. MD&A will usually also touch on the upcoming year, outlining future goals and approaches to new projects. In an attempt to level the playing field for all investors, the SEC maintains an online database called EDGAR (the Electronic Data Gathering, Analysis, and Retrieval system) online from which investors can access this and other information filed with the agency. Quarterly and semiannual reports from public companies are crucial for investors to make sound decisions when investing in the capital markets. Unlike banking, investment in the capital markets is not guaranteed by the federal government. The potential for big gains needs to be weighed against that of sizable losses. Mandatory disclosure of financial and other information about the issuer and the security itself gives private individuals as well as large institutions the same basic facts about the public companies they invest in, thereby increasing public scrutiny while reducing insider trading and fraud. The SEC makes reports available to the public through the EDGAR system. The SEC also offers publications on investment-related topics for public education. The same online system also takes tips and complaints from investors to help the SEC track down violators of the securities laws. The SEC adheres to a strict policy of never commenting on the existence or status of an ongoing investigation. Prior to the enactment of the federal securities laws and the creation of the SEC, there existed so-called blue sky laws. They were enacted and enforced at the state level and regulated the offering and sale of securities to protect the public from fraud. Though the specific provisions of these laws varied among states, they all required the registration of all securities offerings and sales, as well as of every U.S. stockbroker and brokerage firm. However, these blue sky laws were generally found to be ineffective. For example, the Investment Bankers Association told its members as early as 1915 that they could "ignore" blue sky laws by making securities offerings across state lines through the mail. After holding hearings on abuses on interstate frauds (commonly known as the Pecora Commission), Congress passed the Securities Act of 1933 (15 U.S.C. § 77a), which regulates interstate sales of securities (original issues) at the federal level. The subsequent Securities Exchange Act of 1934 (15 U.S.C. § 78d) regulates sales of securities in the secondary market. Section 4 of the 1934 act created the U.S. Securities and Exchange Commission to enforce the federal securities laws; both laws are considered parts of Franklin D. Roosevelt's New Deal raft of legislation. The Securities Act of 1933 is also known as the "Truth in Securities Act" and the "Federal Securities Act", or just the "1933 Act". Its goal was to increase public trust in the capital markets by requiring uniform disclosure of information about public securities offerings. The primary drafters of 1933 Act were Huston Thompson, a former Federal Trade Commission (FTC) chairman, and Walter Miller and Ollie Butler, two attorneys in the Commerce Department's Foreign Service Division, with input from Supreme Court Justice Louis Brandeis. For the first year of the law's enactment, the enforcement of the statute rested with the Federal Trade Commission, but this power was transferred to the SEC following its creation in 1934. In 1934, Roosevelt named his friend Joseph P. Kennedy, a self-made multimillionaire financier and a leader among the Irish-American community, as the insider-as-chairman who knew Wall Street well enough to clean it up. Two of the other five commissioners were James M. Landis (one of the architects of the 1934 Act and other New Deal legislation) and Ferdinand Pecora (Chief Counsel to the Senate Committee on Banking and Currency during its investigation of Wall Street banking and stock brokerage practices). Kennedy added a number of intelligent young lawyers, including William O. Douglas and Abe Fortas, both of whom later became Supreme Court justices. Kennedy's team defined the mission and operating mode for the SEC, making full use of its wide range of legal powers. The SEC had four missions. First and most important was to restore investor confidence in the securities market, which had practically collapsed because of doubts about its internal integrity, and fears of the external threats supposedly posed by anti-business elements in the Roosevelt administration. Second, in terms of integrity, the SEC had to get rid of the penny-ante swindles based on fake information, fraudulent devices, and unsound get-rich-quick schemes. That unsavory element had to be prosecuted and shut down. Thirdly, and much more important than the outright frauds, the SEC had to end the million-dollar insider maneuvers by top officials of major corporations, whereby insiders with access to much better information about the condition of the company knew when to buy or sell their own securities. A crackdown on insider trading was given high priority. Finally, the SEC had to set up a complex system of registration for all securities sold in America, with a clear-cut set of deadlines, rules and guidelines that everyone had to follow. Drafting precise rules was the main challenge faced by the bright young lawyers. The SEC succeeded in its four missions, as Kennedy reassured the American business community that they would no longer be deceived and tricked and taken advantage of by Wall Street. He became a cheerleader for ordinary investors to return to the market and enable the economy to grow again. The law requires that issuing companies register distributions of securities with the SEC prior to interstate sales of these securities, so that investors may have access to basic financial information about issuing companies and risks involved in investing in the securities in question. Since 1994, most registration statements (and associated materials) filed with the SEC can be accessed via the SEC's online system, EDGAR. The Securities Exchange Act of 1934 is also known as "the Exchange Act" or "the 1934 Act". This act regulates secondary trading between individuals and companies which are often unrelated to the original issuers of securities. Entities under the SEC's authority include securities exchanges with physical trading floors such as the New York Stock Exchange (NYSE), self-regulatory organizations (SROs) such as the National Association of Securities Dealers (NASD), the Municipal Securities Rulemaking Board (MSRB), online trading platforms such as the NASDAQ Stock Market (NASDAQ) and alternative trading systems (ATSs), and any other persons (e.g., securities brokers) engaged in transactions for the accounts of others. Later SEC commissioners and chairmen include William O. Douglas, Jerome Frank (one of the leaders of the legal realism movement), and William J. Casey (who later headed the Central Intelligence Agency under President Ronald Reagan). The Commission has five Commissioners who are appointed by the President of the United States. The commission is kept Non-partisan as no more than three Commissioners may belong to the same political party. Their terms last five years and are staggered so that one commissioner's term ends on June 5 of each year. Service may continue up to eighteen additional months past term expiration. The President also designates one of the Commissioners as Chairman, the SEC's top executive. However, the President does not possess the power to fire the appointed Commissioners, a provision that was made to ensure the independence of the SEC. This issue arose during the 2008 presidential election in connection with the ensuing financial crises. Within the SEC, there are five divisions. Headquartered in Washington, D.C., the SEC has 11 regional offices throughout the US. Corporation Finance is the division that oversees the disclosure made by public companies, as well as the registration of transactions, such as mergers, made by companies. The division is also responsible for operating EDGAR. The Trading and Markets division oversees self-regulatory organizations such as the Financial Industry Regulatory Authority (FINRA) and Municipal Securities Rulemaking Board (MSRB) and all broker-dealer firms and investment houses. This division also interprets proposed changes to regulations and monitors operations of the industry. In practice, the SEC delegates most of its enforcement and rulemaking authority to FINRA. In fact, all trading firms not regulated by other SROs must register as a member of FINRA. Individuals trading securities must pass exams administered by FINRA to become registered representatives. The Enforcement Division works with the other three divisions, and other Commission offices, to investigate violations of the securities laws and regulations and to bring actions against alleged violators. The SEC generally conducts investigations in private. The SEC's staff may seek voluntary production of documents and testimony, or may seek a formal order of investigation from the SEC, which allows the staff to compel the production of documents and witness testimony. The SEC can bring a civil action in a U.S. District Court, or an administrative proceeding which is heard by an independent administrative law judge (ALJ). The SEC does not have criminal authority but may refer matters to state and federal prosecutors. The director of the SEC's Enforcement Division Robert Khuzami left the office in February 2013. The Office of Information Technology, which supports the Commission and staff in information technology, including application development, infrastructure operations. and engineering, user support, IT program management, capital planning, security, and enterprise architecture. The Inspector General. The SEC announced in January 2013 that it had named Carl Hoecker the new inspector general. He has a staff of 22. The SEC Office of the Whistleblower provides assistance and information from a whistleblower who knows of possible securities law violations: this can be among the most powerful weapons in the law enforcement arsenal of the Securities and Exchange Commission. Created by Section 922 of the Dodd-Frank Wall Street Reform and Consumer Protection Act Dodd–Frank Wall Street Reform and Consumer Protection Act amended the Securities Exchange Act of 1934 (the "Exchange Act") by, among other things, adding Section 21F, entitled "Securities Whistleblower Incentives and Protection." Section 21F directs the Commission to make monetary awards to eligible individuals who voluntarily provide original information that leads to successful Commission enforcement actions resulting in the imposition of monetary sanctions over $1,000,000, and certain successful related actions. Comment letters are issued by the SEC's Division of Corporation Finance in response to a company's public filing. This letter, initially private, contains an itemized list of requests from the SEC. Each comment in the letter asks the filer to provide additional information, modify their submitted filing, or change the way they disclose in future filings. The filer must reply to each item in the comment letter. The SEC may then reply back with follow-up comments. This correspondence is later made public. In October 2001 the SEC wrote to CA, Inc., covering 15 items, mostly about CA's accounting, including 5 about revenue recognition. The chief executive officer of CA, to whom the letter was addressed, pleaded guilty to fraud at CA in 2004. In June 2004, the SEC announced that it would publicly post all comment letters, to give investors access to the information in them. An analysis of regulatory filings in May 2006 over the prior 12 months indicated, that the SEC had not accomplished what it said it would do. The analysis found 212 companies that had reported receiving comment letters from the SEC, but only 21 letters for these companies were posted on the SEC's website. John W. White, the head of the Division of Corporation Finance, told the New York Times in 2006: "We have now resolved the hurdles of posting the information... We expect a significant number of new postings in the coming months." No-action letters are letters by the SEC staff indicating that the staff will not recommend to the Commission that the SEC undertake enforcement action against a person or company if that entity engages in a particular action. These letters are sent in response to requests made when the legal status of an activity is not clear. These letters are publicly released and increase the body of knowledge on what exactly is and is not allowed. They represent the staff's interpretations of the securities laws and, while persuasive, are not binding on the courts. One such use, from 1975 to 2007, was with the nationally recognized statistical rating organization (NRSRO), a credit rating agency that issues credit ratings that the SEC permits other financial firms to use for certain regulatory purposes. In the latest Center for Effective Government analysis of 15 federal agencies which receive the most Freedom of Information Act (FOIA) requests published in 2015 (using 2012 and 2013 data, the most recent years available), the SEC was among the 5 lowest performers, earned a D- by scoring 61 out of a possible 100 points, i.e. did not earn a satisfactory overall grade. It had deteriorated from a D- in 2013. The SEC's Enforcement Division took a number of major actions in 2009–12. The SEC announced on September 17, 2008, strict new rules to prohibit all forms of "naked short selling" as a measure to reduce volatility in turbulent markets. The SEC investigated cases involving individuals attempting to manipulate the market by passing false rumors about certain financial institutions. The Commission has also investigated trading irregularities and abusive short-selling practices. Hedge fund managers, broker-dealers, and institutional investors were also asked to disclose under oath certain information pertaining to their positions in credit default swaps. The Commission also negotiated the largest settlements in the history of the SEC (approximately $51 billion in all) on behalf of investors who purchased auction rate securities from six different financial institutions. The SEC has been criticized "for being too 'tentative and fearful' in confronting wrongdoing on Wall Street", and for doing "an especially poor job of holding executives accountable". Christopher Cox, the former SEC chairman, has recognized the organization's multiple failures in relation to the Bernard Madoff fraud. Starting with an investigation in 1992 into a Madoff feeder fund that only invested with Madoff, and which, according to the SEC, promised "curiously steady" returns, the SEC did not investigate indications that something was amiss in Madoff's investment firm. The SEC has been accused of missing numerous red flags and ignoring tips on Madoff's alleged fraud. As a result, Cox said that an investigation would ensue into "all staff contact and relationships with the Madoff family and firm, and their impact, if any, on decisions by staff regarding the firm". SEC Assistant Director of the Office of Compliance Investigations Eric Swanson had met Madoff's niece, Shana Madoff, when Swanson was conducting an SEC examination of whether Bernard Madoff was running a Ponzi scheme because she was the firm's compliance attorney. The investigation was closed, and Swanson subsequently left the SEC, and married Shana Madoff. Approximately 45 percent of institutional investors thought that better oversight by the SEC could have prevented the Madoff fraud. Harry Markopolos complained to the SEC's Boston office in 2000, telling the SEC staff they should investigate Madoff because it was impossible to legally make the profits Madoff claimed using the investment strategies that he said he used. A similar failure occurred in the case of Allen Stanford, who sold fake certificates of deposit to tens of thousands of people, many of them working-class retirees. In 1997, the SEC's own examiners spotted the fraud and warned about it. But the Enforcement division would not pursue Stanford, despite repeated warnings by SEC examiners over the years. After the Madoff fraud emerged, the SEC finally took action against Stanford in 2009. In June 2010, the SEC settled a wrongful termination lawsuit with former SEC enforcement lawyer Gary J. Aguirre, who was terminated in September 2005 following his attempt to subpoena Wall Street figure John J. Mack in an insider trading case involving hedge fund Pequot Capital Management; Mary Jo White, who later served as chair of the SEC, was at the time representing Morgan Stanley and was involved in this case. While the insider case was dropped at the time, a month prior to the SEC's settlement with Aguirre the SEC filed charges against Pequot. The Senate released a report in August 2007 detailing the issue and calling for reform of the SEC. On September 26, 2016 Democratic senator Mark Warner sent a letter to the SEC, asking them to evaluate whether the current disclosure regime was adequate, citing the low number of companies' disclosures to date. In 2009, the Project on Government Oversight, a government watchdog group, sent a letter to Congress criticizing the SEC for failing to implement more than half of the recommendations made to it by its Inspector General. According to POGO, in the prior two years, the SEC had taken no action on 27 out of 52 recommended reforms suggested in Inspector General reports, and still had a "pending" status on 197 of the 312 recommendations made in audit reports. Some of the recommendations included imposing disciplinary action on SEC employees who receive improper gifts or other favors from financial companies, and investigating and reporting the causes of the failures to detect the Madoff ponzi scheme. In a 2011 article by Matt Taibbi in Rolling Stone, former SEC employees were interviewed and commented negatively on the SEC's Office of the Inspector General (OIG). Going to the OIG was "well-known to be a career-killer". Because of concerns raised by David P. Weber, former SEC Chief Investigator, regarding conduct by SEC Inspector General H. David Kotz, Inspector General David C. Williams of the U.S. Postal Service was brought in to conduct an independent, outside review of Kotz's alleged improper conduct in 2012. Williams concluded in his 66-page Report that Kotz violated ethics rules by overseeing probes that involved people with whom he had conflicts of interest due to "personal relationships." The report questioned Kotz's work on the Madoff investigation, among others, because Kotz was a "very good friend" with Markopolos. It concluded that while it was unclear when Kotz and Markopolos became friends, it would have violated U.S. ethics rules if their relationship began before or during Kotz's Madoff investigation. The report also found that Kotz himself "appeared to have a conflict of interest" and should not have opened his Standford investigation, because he was friends with a female attorney who represented victims of the fraud. According to former SEC employee and whistleblower Darcy Flynn, also reported by Taibbi, the agency routinely destroyed thousands of documents related to preliminary investigations of alleged crimes committed by Deutsche Bank, Goldman Sachs, Lehman Brothers, SAC Capital, and other financial companies involved in the Great Recession that the SEC was supposed to have been regulating. The documents included those relating to "Matters Under Inquiry", or MUI, the name the SEC gives to the first stages of the investigation process. The tradition of destruction began as early as the 1990s. This SEC activity eventually caused a conflict with the National Archives and Records Administration when it was revealed to them in 2010 by Flynn. Flynn also described a meeting at the SEC in which top staff discussed refusing to admit the destruction had taken place, because it was possibly illegal. The debate boils down to this: What does an investigative record mean to Congress? And the courts? Under the law, those investigative records must be kept for 25 years. But federal officials say no judge has ruled that papers related to early-stage SEC inquiries are investigative records. The SEC's inspector general says he's conducting a thorough investigation into the allegations. [Kotz] tells NPR that he'll issue a report by the end of September. In addition to working with various self-regulatory organizations such as the Financial Industry Regulatory Authority (FINRA), the Securities Investor Protection Corporation (SIPC), and Municipal Securities Rulemaking Board (MSRB), the SEC also works with other federal agencies, state securities regulators, international securities agencies and law enforcement agencies. In 1988 Executive Order 12631 established the President's Working Group on Financial Markets. The Working Group is chaired by the Secretary of the Treasury and includes the Chairman of the SEC, the Chairman of the Federal Reserve and the Chairman of the Commodity Futures Trading Commission. The goal of the Working Group is to enhance the integrity, efficiency, orderliness, and competitiveness of the financial markets while maintaining investor confidence. The Securities Act of 1933 was originally administered by the Federal Trade Commission. The Securities Exchange Act of 1934 transferred this responsibility from the FTC to the SEC. The main mission of the FTC is to promote consumer protection and to eradicate anti-competitive business practices. The FTC regulates general business practices, while the SEC focuses on the securities markets. The Temporary National Economic Committee was established by joint resolution of Congress 52 Stat. 705 on June 16, 1938. It was in charge of reporting to Congress on abuses of monopoly power. The committee was defunded in 1941, but its records are still under seal by order of the SEC. The Municipal Securities Rulemaking Board (MSRB) was established in 1975 by Congress to develop rules for companies involved in underwriting and trading municipal securities. The MSRB is monitored by the SEC, but the MSRB does not have the authority to enforce its rules. While most violations of securities laws are enforced by the SEC and the various SROs it monitors, state securities regulators can also enforce statewide securities blue sky laws. States may require securities to be registered in the state before they can be sold there. National Securities Markets Improvement Act of 1996 (NSMIA) addressed this dual system of federal-state regulation by amending Section 18 of the 1933 Act to exempt nationally traded securities from state registration, thereby pre-empting state law in this area. However, NSMIA preserves the states' anti-fraud authority over all securities traded in the state. The SEC also works with federal and state law enforcement agencies to carry out actions against actors alleged to be in violation of the securities laws. The SEC is a member of International Organization of Securities Commissions (IOSCO), and uses the IOSCO Multilateral Memorandum of Understanding as well as direct bilateral agreements with other countries' securities commissions to deal with cross-border misconduct in securities markets. ^ FY 2017 Congressional Budget Justification (PDF). U.S. Securities and Exchange Commission. 2016. p. 14. ^ SEC (June 10, 2013). "What We Do". SEC.gov. U.S. Securities and Exchange Commission. Retrieved March 24, 2017. ^ "The Role of the SEC". Investor.gov. ^ a b "Blue Sky laws". Seclaw.com. July 7, 2007. Retrieved March 1, 2013. ^ Seligman, Joel (2003). The Transformation of Wall Street. Aspen. pp. 45, 51–52. ^ He was the father of president John F. Kennedy. David Nasaw, The Patriarch: The Remarkable Life and Turbulent Times of Joseph P. Kennedy (2012) pp 204-37. ^ "Securities Act of 1933" (PDF). Retrieved March 1, 2013. ^ "Securities Exchange Act of 1934" (PDF). Retrieved March 1, 2013. ^ "Current SEC Commissioners". Sec.gov. December 17, 2012. Retrieved March 1, 2013. ^ "National Association of Securities Dealers". Finra.com. Retrieved March 1, 2013. ^ "How does the NASD differ from the SEC?" Investopedia. Investopedia Inc.
^ Lemke and Lins, Regulation of Investment Advisers (Thomson West, 2013 ed. ); Lemke, Lins and Smith, Regulation of Investment Companies (Matthew Bender, 2013 ed.). ^ "How the SEC Protects Investors, Maintains Market Integrity, and Facilitates Capital Formation (Securities and Exchange Commission)". Sec.gov. Retrieved March 1, 2013. ^ Protess, Ben (February 11, 2013). "S.E.C. 's Revolving Door Hurts Its Effectiveness, Report Says". Dealbook.nytimes.com. Retrieved March 1, 2013. ^ Schroeder, Peter (January 29, 2013). "SEC names new inspector general – The Hill's On The Money". Thehill.com. Retrieved March 1, 2013. ^ "SEC.gov - Jon Rymer Named Interim Inspector General". www.sec.gov. ^ Greene, Jenna,"The Conversation Stopper: SEC Inspector General H. David Kotz: Staffers may not like riding the elevator with him, but the SEC is taking his advice", Corporate Counsel, July 27, 2011. Retrieved August 18, 2011. ^ "Office of the SEC Whistleblower". Sec.gov. Retrieved December 5, 2013. This article incorporates text from this source, which is in the public domain. ^ https://www.sec.gov/about/offices/owb/annual-report-2012.pdf This article incorporates text from this source, which is in the public domain. ^ "Fast Answers: Comment Letters". SEC.gov. Retrieved October 16, 2015. ^ "Filing Review Process". SEC.gov. Retrieved October 16, 2015. ^ a b c Gretchen Morgenson (May 28, 2008). "Deafened by the S.E.C. 's Silence, He Sued". The New York Times. ^ Lauren Tara LaCapra (September 17, 2008). "Naked-Shorts Ban Gets Chilly Reception". The street. ^ Ellis, David (September 17, 2008). "Regulator enacts new ruling banning 'naked' short selling on all public companies". CNN. Retrieved May 26, 2010. ^ Jason Breslow (Director) (April 8, 2014). "Is SEC "Fearful" of Wall Street? Agency Insider Says Yes". Frontline (U.S. TV series). PBS. Retrieved December 14, 2014. ^ Schmidt, Robert (April 8, 2014). "SEC Goldman Lawyer Says Agency Too Timid on Wall Street Misdeeds". Bloomberg. Retrieved December 14, 2014. ^ Kidney, Jim (2014). "Retirement Remarks" (PDF). SEC Union, NTEU Chapter 293. Archived from the original (PDF) on September 12, 2014. Retrieved November 20, 2014. ^ Chung, Joanna (December 17, 2008). "Financial Times: SEC chief admits to failures in Madoff case". Ft.com. Retrieved March 1, 2013. ^ Moyer, Liz (December 23, 2008). "Could SEC Have Stopped Madoff Scam In 1992?". Forbes. Archived from the original on February 1, 2009. Retrieved December 24, 2008. ^ Serchuk, David (December 22, 2008). "Love, Madoff And The SEC". Forbes. Retrieved December 24, 2008. ^ Labaton, Stephen (December 19, 2008). "Unlikely Player Pulled Into Madoff Swirl". The New York Times. ^ "Little faith in regulators and rating agencies, as LP demand for alternatives cools off, finds survey". ^ Markopolos, H (2010). No One Would Listen: A True Financial Thriller. John Wiley & Sons. pp. 55–60. ISBN 0-470-55373-1. ^ Kurdas, Chidem. Political Sticky Wicket: The Untouchable Ponzi Scheme of Allen Stanford. ^ a b Blaylock D. (June 2010). SEC Settles with Aguirre. Government Accountability Project. ^ Choice of Mary Jo White to Head SEC Puts Fox In Charge of Hen House. Rolling Stone. ^ Committee on Finance, Committee on the Judiciary.The Firing of an SEC Attorney and the Investigation of Pequot Capital Management. U.S. Government Printing Office. ^ Johnson, Fawn. (December 17, 2009) "Group Alleges Slack SEC Response to Internal Watchdog". NASDAQ. ^ Brian, Danielle. (December 16, 2009) "POGO Letter to SEC Chairman Mary Schapiro regarding SEC's failure to act on hundreds of Inspector General recommendations" Archived August 4, 2010, at the Wayback Machine. The Project On Government Oversight Website. ^ a b Schmidt, Robert (January 25, 2013). "SEC Said to Back Hire of U.S. Capitol Police Inspector General". Bloomberg. Retrieved February 10, 2013. ^ a b c Schmidt, Robert; Joshua Gallu (October 26, 2012). "Former SEC Watchdog Kotz Violated Ethics Rules, Review Finds". Bloomberg. Retrieved February 10, 2013. ^ a b Robert Schmidt and Joshua Gallu (October 6, 2012). "Former SEC Watchdog Kotz Violated Ethics Rules, Review Finds". Business Week. Retrieved February 12, 2013. ^ Sarah N. Lynch (November 15, 2012). "David Weber Lawsuit: Ex-SEC Investigator Accused Of Wanting To Carry A Gun At Work, Suing For $20 Million". The Huffington Post. Retrieved February 10, 2013. ^ "David Kotz, Ex-SEC Inspector General, May Have Had Conflicts Of Interest". The Huffington Post. October 5, 2012. Retrieved February 10, 2013. ^ Johnson, Carrie, "SEC Documents Destroyed, Employee Tells Congress", National Public Radio (transcript and audio), August 18, 2011. Retrieved August 18, 2011. ^ "National Archives". Archives.gov. Retrieved March 1, 2013. ^ "National Securities Markets Improvement Act". AccreditedInvestors.net. 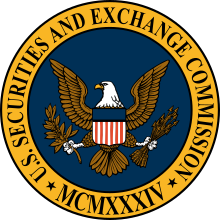 Wikimedia Commons has media related to United States Securities and Exchange Commission.